Jean-Charles Arnault is currently Research Director at CEA. He obtained his PhD in 1993 at Poitiers University, France. From 1993 to 2007, he was assistant professor at Strasbourg University and obtained his HDR in 2001. His research activities in Strasbourg concerned diamond nucleation on different substrates and interactions between MPCVD plasmas with surfaces using in situ surface analysis methods (electron spectroscopies), and scanning probe microscopies. These studies were completed by electron microscopies. In 2003, he moved to the "Physics and Chemistry of Surfaces and Interfaces" at CEA for a research period focused on diamond on reconstructed cubic silicon carbide surfaces (2003-2007). Since 2007, he performed his research activities in the Diamond Sensors Laboratory at CEA. His research interests are currently focused on diamond nanoparticles, diamond heteroepitaxy and the growth of boron doped single crystalline diamond. For diamond nanoparticles, surface modifications by MPCVD plasma or annealing are performed to control their surface terminations for efficient grafting. Intrinsic properties of hydrogenated and surface graphitized nanodiamonds were investigated during the last years especially for bioapplications. In 2008, he initiated diamond heteroepitaxy on iridium at CEA. This topic is now developed in collaboration with a French consortium involving four other groups. Jean-Charles Arnault is regularly involved in the organization of international symposia related to these topics (Spring and Fall MRS, E-MRS). In January 2015, he became an Editor of Diamond and Related Materials. 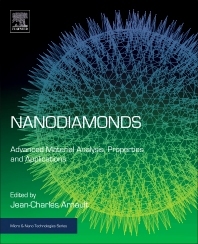 He contributed recently to three chapters of book, two of these chapters concern diamond nanoparticles.